Except as otherwise indicated, the Site, and all text, images, marks, logos and other content displayed on the Site, including, without limitation, all logos, designs, text, graphics, pictures, information, data, software, sound files, other files, Content (as defined below) and the selection and arrangement thereof (collectively, the “Site Content”) are the proprietary property of Paramedic Training Spot or its licensors or users and are protected by U.S. and international copyright laws. The Site and all Site Content is © 2019, All Rights Reserved. The name and logos of Paramedic Training Spot, and the look and feel of the Site, including all graphics, icons, scripts, page headers, and layouts, are registered and/or common law trademarks and/or trade dress of Paramedic Training Spot, and may not be copied, imitated or used, in whole or in part, without the prior written permission of Paramedic Training Spot. All other trademarks, registered trademarks, product names and company names or logos mentioned or displayed on the Site are the property of their respective owners. Reference to any products, services, processes or other information, by trade name, trademark, manufacturer, supplier or otherwise does not constitute or imply endorsement, sponsorship or recommendation thereof by Paramedic Training Spot. You may not use any registered or common law trademark or service mark of Paramedic Training Spot or any logo or other proprietary graphic of Paramedic Training Spot to link to the Site without the express written permission of Paramedic Training Spot. Further, you may not frame or utilize framing techniques to enclose any Site Content or any Paramedic Training Spot trademark, service mark, logo or other proprietary information, without Paramedic Training Spot’s express written consent. The Site may contain links to third-party Web sites (“Third-Party Sites”) and third-party content (“Third-Party Content”) as a service to those interested in this information. You use links to Third-Party Sites, and any Third-Party Content therein, at your own risk. Paramedic Training Spot does not monitor or control and makes no claim or representation regarding Third-Party Content or Third-Party Sites. Paramedic Training Spot provides these links only as a convenience, and a link to a Third-Party Site or Third-Party Content does not imply Paramedic Training Spot’s endorsement, adoption or sponsorship of, or affiliation with, such Third-Party Site or Third-Party Content. YOU agree that Paramedic Training Spot shall not be liable, directly or indirectly, for any damages or losses caused or alleged to be caused by or in connection with the use or reliance on any such Third-Party Site or Third-Party Content or any goods or services available on, from or through any such Third-Party Site or Third-Party. Paramedic Training Spot accepts no responsibility for the quality, content, policies, nature, or reliability of Third-Party Content, Third-Party Sites, or Web sites linking to the Site. When you leave the Site, our terms and policies no longer govern. You should review applicable terms and policies, including privacy and data gathering practices, of any Third-Party Site, and should make whatever investigation you feel necessary or appropriate before proceeding with any transaction with any third party. Content that, in the sole judgment of Paramedic Training Spot, is objectionable or that restricts or inhibits any other person from using or enjoying the Interactive Areas or the Site, or that may expose Paramedic Training Spot or its affiliates or its users to any harm or liability of any sort. Except as specifically indicated, by posting or distributing Content to or through the Site, you grant Paramedic Training Spot and its affiliates (a) a nonexclusive, royalty-free, perpetual, transferable, irrevocable and fully sublicensable right to use, reproduce, modify, adapt, translate, distribute, publish, create derivative works from and publicly display and perform such Content throughout the world in any media, now known or hereafter devised; and (b) the right to use the name that you submit in connection with such Content. If it is determined that you retain moral rights (including rights of attribution or integrity) in the Content, you hereby declare that (a) you do not require that any personally identifying information be used in connection with the Content, or any derivative works of or upgrades or updates thereto; (b) you have no objection to the publication, use, modification, deletion and exploitation of the Content by Paramedic Training Spot or its licensees, successors and assigns; (c) you forever waive and agree not to claim or assert any entitlement to any and all moral rights of an author in any of the Content; and (d) you forever release Paramedic Training Spot, and its licensees, successors and assigns, from any claims that you could otherwise assert against Paramedic Training Spot by virtue of any such moral rights. Paramedic Training Spot may run advertisements and promotions from third parties on the Site. Your business dealings or correspondence with, or participation in promotions of, parties other than Paramedic Training Spot, and any terms, conditions, warranties or representations associated with such dealings, are solely between you and such third party. Paramedic Training Spot is not responsible or liable for any loss or damage of any sort incurred as the result of any such dealings or as the result of the presence of third-party advertisers on the Site. 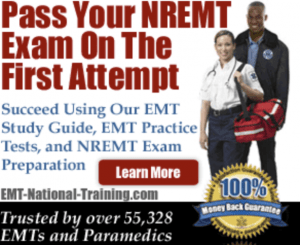 Paramedic Training Spot does not warrant the accuracy, completeness, or reliability of any information on the Site, including but not limited to product descriptions, prices, and reviews, or the content of any third-party advertisement. Paramedic Training Spot provides this Site and the information it contains for informational purposes only. Paramedic Training Spot does not endorse any product or service, any merchant, or any reviews or comments regardless of the source. Paramedic Training Spot has no control over the business practices of any third-party merchant, nor does it control in any way the quality, safety or legality of any item listed on the Site or any business transaction that occurs between any user of this Site and any third-party merchant. IN THE EVENT OF A DISPUTE BETWEEN YOU AND ANY MERCHANT LISTED OR ADVERTISED ON THE SITE, YOU RELEASE, TO THE MAXIMUM EXTENT PERMITTED BY LAW, PARAMEDIC TRAINING SPOT, ITS PARENTS, SUBSIDIARIES, AFFILIATES, PARTNERS OR OTHER THIRD PARTIES UNDER CONTRACT WITH PARAMEDIC TRAINING SPOT, AND THEIR RESPECTIVE OFFICERS, DIRECTORS, EMPLOYEES, AGENTS, AND LEGAL REPRESENTATIVES FROM AND AGAINST CLAIMS AND DAMAGES OF ANY KIND, KNOWN OR UNKNOWN, SUSPECTED OR UNSUSPECTED, DISCLOSED OR UNDISCLOSED, ARISING OUT OF OR IN ANY WAY CONNECTED WITH SUCH A DISPUTE. You agree to (a) provide accurate, current and complete information about you as may be prompted by any registration forms on the Site (“Registration Data”); (b) maintain the security of your password; (c) maintain and promptly update the Registration Data, and any other information you provide to Paramedic Training Spot, and to keep it accurate, current and complete; and (d) accept all risks of unauthorized access to the Registration Data and any other information you provide to Paramedic Training Spot. EXCEPT AS EXPRESSLY PROVIDED TO THE CONTRARY IN WRITING, THE SITE, THE SITE CONTENT AND THE SERVICES PROVIDED ON OR IN CONNECTION THEREWITH (THE “SERVICES”) ARE PROVIDED ON AN “AS IS” BASIS WITHOUT WARRANTIES OF ANY KIND, EITHER EXPRESS OR IMPLIED. PARAMEDIC TRAINING SPOT SPECIFICALLY DISCLAIMS ALL OTHER WARRANTIES, EXPRESS OR IMPLIED, INCLUDING WITHOUT LIMITATION IMPLIED WARRANTIES OF MERCHANTABILITY, FITNESS FOR A PARTICULAR PURPOSE, TITLE AND NONINFRINGEMENT AS TO THE SERVICES, INFORMATION, AND CONTENT ON THE SITE. PARAMEDIC TRAINING SPOT DOES NOT REPRESENT OR WARRANT THAT MATERIALS IN THE SITE OR THE SERVICES ARE ACCURATE, COMPLETE, RELIABLE, OR CURRENT, AND EXPRESSLY DISCLAIMS ANY WARRANTY OR REPRESENTATION AS TO THE ACCURACY, COMPLETENESS, RELIABILITY, OR CURRENCY OF THE SITE, THE SITE CONTENT OR ANY PORTION THEREOF. PARAMEDIC TRAINING SPOT IS NOT RESPONSIBLE FOR TYPOGRAPHICAL ERRORS OR OMISSIONS IN ANY SITE CONTENT. WHILE PARAMEDIC TRAINING SPOT ATTEMPTS TO MAKE YOUR ACCESS TO AND USE OF THE SITE AND THE SERVICES SAFE, PARAMEDIC TRAINING SPOT CANNOT AND DOES NOT REPRESENT OR WARRANT THAT THE SITE OR ITS SERVER(S) ARE FREE OF VIRUSES OR OTHER HARMFUL COMPONENTS. IT IS YOUR RESPONSIBILITY TO SELECT, PURCHASE, AND USE SOFTWARE TO DETECT AND DISINFECT VIRUSES FROM ANY DOWNLOAD. YOU WAIVE AND COVENANT NOT TO ASSERT ANY CLAIMS OR ALLEGATIONS OF ANY NATURE WHATSOEVER AGAINST PARAMEDIC TRAINING SPOT, ITS AFFILIATES, OR THEIR RESPECTIVE DIRECTORS, OFFICERS, EMPLOYEES OR AGENTS ARISING OUT OF OR IN ANY WAY RELATING TO YOUR USE OF THE SITE, THE SERVICES, OR THE SITE CONTENT CONTAINED IN OR ACCESSIBLE THROUGH THE SITE, INCLUDING, WITHOUT LIMITATION, ANY CLAIMS OR ALLEGATIONS RELATING TO THE ALLEGED INFRINGEMENT OF PROPRIETARY RIGHTS, ALLEGED INACCURACY OF SITE CONTENT, OR ALLEGATIONS THAT PARAMEDIC TRAINING SPOT HAS OR SHOULD INDEMNIFY, DEFEND OR HOLD HARMLESS YOU OR ANY THIRD PARTY FROM ANY CLAIM OR ALLEGATION ARISING FROM YOUR USE OR OTHER EXPLOITATION OF THE SITE. YOU USE THE SITE AT YOUR OWN RISK. WITHOUT LIMITATION OF THE FOREGOING, NEITHER PARAMEDIC TRAINING SPOT NOR ANY PARTIES PROVIDING SITE CONTENT SHALL BE LIABLE FOR ANY DIRECT, INDIRECT, SPECIAL, EXEMPLARY, PUNITIVE, OR CONSEQUENTIAL DAMAGES, OR ANY OTHER DAMAGES OF ANY KIND, INCLUDING BUT NOT LIMITED TO LOSS OF USE, LOSS OF PROFITS OR LOSS OF DATA, WHETHER IN AN ACTION IN CONTRACT, TORT (INCLUDING BUT NOT LIMITED TO NEGLIGENCE) OR OTHERWISE, ARISING OUT OF OR IN ANY WAY CONNECTED WITH THE USE OF THE SITE, THE SERVICES, THE SITE CONTENT OR THE MATERIALS CONTAINED IN OR ACCESSIBLE THROUGH THE SITE, INCLUDING WITHOUT LIMITATION ANY DAMAGES CAUSED BY OR RESULTING FROM YOUR RELIANCE ON ANY SITE CONTENT OR OTHER INFORMATION OBTAINED FROM PARAMEDIC TRAINING SPOT OR ACCESSIBLE VIA THE SITE, OR THAT RESULT FROM MISTAKES, ERRORS, OMISSIONS, INTERRUPTIONS, DELETION OF FILES OR EMAIL, DEFECTS, VIRUSES, DELAYS IN OPERATION OR TRANSMISSION OR ANY FAILURE OF PERFORMANCE, WHETHER OR NOT RESULTING FROM ACTS OF GOD, COMMUNICATIONS FAILURE, THEFT, DESTRUCTION OR UNAUTHORIZED ACCESS TO PARAMEDIC TRAINING SPOT’S RECORDS, PROGRAMS OR SERVICES. THE FOREGOING APPLIES EVEN IF PARAMEDIC TRAINING SPOT HAS BEEN ADVISED OF THE POSSIBILITY OF SUCH DAMAGES. IN NO EVENT SHALL THE AGGREGATE LIABILITY OF PARAMEDIC TRAINING SPOT, WHETHER IN CONTRACT, WARRANTY, TORT (INCLUDING NEGLIGENCE, WHETHER ACTIVE, PASSIVE OR IMPUTED), PRODUCT LIABILITY, STRICT LIABILITY OR OTHER THEORY, ARISING OUT OF OR RELATING TO THE USE OF THE SITE EXCEED ANY COMPENSATION YOU PAY, IF ANY, TO PARAMEDIC TRAINING SPOT FOR ACCESS TO OR USE OF THE SITE. The Site (excluding any linked Third-Party sites) is controlled by Paramedic Training Spot, Inc. and operated by Paramedic Training Spot, Inc. from its offices in Massachusetts. While Paramedic Training Spot has made no effort to publish the Site elsewhere, the Site is accessible in all 50 states of the United States and in other countries. You and Paramedic Training Spot both benefit from establishing a predictable legal environment in regard to the Site. Therefore, you and Paramedic Training Spot explicitly agree that all disputes, claims or other matters arising from or relating to your use of the Site will be governed by the laws of the Commonwealth of Massachusetts, without regard to its conflicts of law principles. You agree that any claims you may have against Paramedic Training Spot, Inc. arising from or relating to the Site will be heard and resolved in a court of competent subject matter jurisdiction located in Massachusetts. You consent to the personal jurisdiction of such courts over you, stipulate to the fairness and convenience of proceeding in such courts, covenant not to assert any objection to proceeding in such courts, and you expressly waive any right to proceed in any other court. If you choose to access the Site from locations other than Massachusetts, you will be responsible for compliance with all local laws of such other jurisdiction.